You may remember back in August 2009 Nicole Richie auctioned some of her dresses on Ebay to raise money for The Richie Madden Children's foundation. This started a bidding war .. Everyone wanted a piece of Nicole Richie's closet. ...But who was lucky enough to win a piece of Nicole Richie's closet ? Megan won not one item but two! 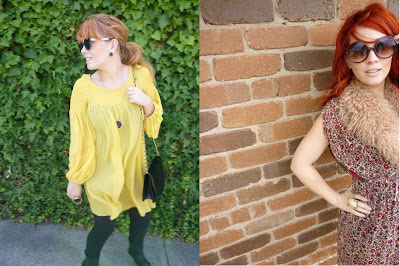 Megan won Nicole Richie's yellow tunic dress and vintage red dress. It is good to see Nicole Richie's stunning pieces went to another fabulous closet!